Generally, I'm wary whenever a star of a television show directs an episode of said show. More often than not, he or she puts greater focus on the visuals than on the performances or story. This was the case when Mark-Paul Gosselaar directed an episode of the abysmal Franklin & Bash, a show that was OK and then descended into a horror that I danced when I heard it was cancelled. Hidden wasn't horrible, but parts of it stretched credibility and director Max Thieriot (who did not appear as his character of Dylan Massett) did care about visuals a tad much. 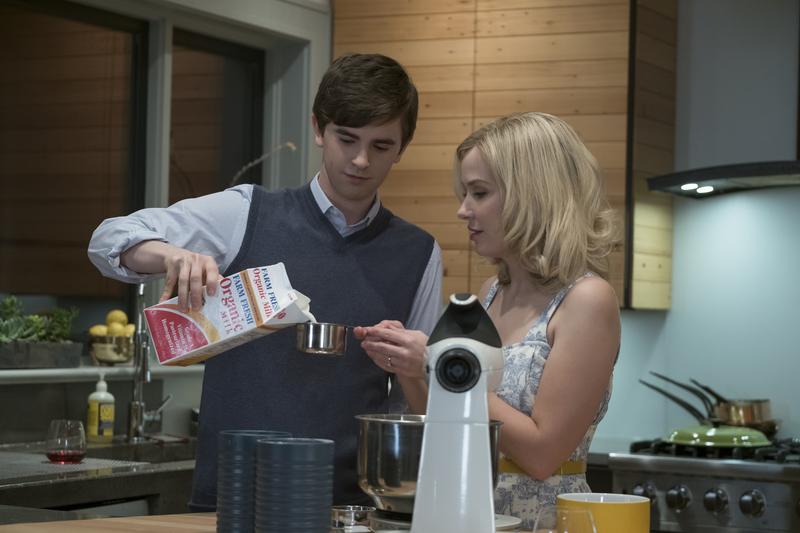 Norman Bates (Freddie Highmore) finds himself beset by problems both good and bad. He wants to do the right thing and tell the police about the accident that killed his uncle Caleb. However, both Chick (Ryan Hurst), who ran him down, and Mother Norma Bates (Vera Farmiga) are adamant Caleb be done away with. Reluctantly, Norman agrees to let Chick take care of it, which involves him giving Caleb a Viking funeral. Norman then has to stop Chick from moving in and trying to get rid of the car of the man sent to kill him. His delusions of Mother are more pronounced, pushing him further into complete hysteria. Finally, there's his growing attraction to Madeleine Loomis (Isabelle McNally). Not only has Norman given her Mother's clothes (which fit her like a glove), but their attraction to each other grows. She invites Norman to her house for dinner (Sam being away again) and they kiss. As the kissing gets more intense, Norman has a vision of Mother and of Madeleine lying dead, her throat slashed. In a panic, he flees to his house, where he finds himself truly alone. In the other story, former Alex Romero (Nestor Carbonell) is still fleeing from the law and determined to get to Norman, despite the massive pellet gunshot wound he has. He manages to live long enough to find a payphone and call for an ambulance, and while the EMT go into an apartment complex or hotel, he goes in, steals what he needs to do his own healing, and then moves on. That is one aspect of Hidden that made me wonder whether Bates Motel had gone a bit off. Here's Romero, having been shot once, bleeding profusely, and he still is able to walk for miles and miles and have strength and clarity of mind to hatch this plan to give himself treatment before reaching the home of a friend who can shelter him. Something about that struck me as a bit far-fetched, which is something given the overall cuckoo-nature of Bates Motel. Then we have these scenes and moments where I figure Thieriot wanted to show the visual flair he could bring (and as a side note, given that both Nestor Carbonell and Freddie Highmore are also set to direct a couple of episodes, with Highmore having penned his second one, I wonder whether given it's the last season the producers opted to let their cast have free range). We have the Viking funeral, beautiful looking, yes, but somehow a bit bonkers. I'm a bit torn on that scene: one on hand, it is logical to burn Caleb's body and Chick has his own dramatic flair that makes him a bit crazy too. On the other, it is excessively elaborate and brought to mind "See a Viking Funeral!" from the spoof trailer to History of the World Part II. Part of me wanted to chuckle at this scene (beautiful though it was). The vision of a dead Madeleine and the final shot where Norman rushes into his house, a single blue light dominating as he walks towards us, again I felt were there to draw attention to itself. I was also uninterested in the long, long scene where Norman and "Norma" went to find the car of their intended assassin only to opt to not move it. It felt long and unnecessary, going on to where I was losing interest in watching. Truth be told, my mind and eyes were beginning to drift off as Hidden continued, wondering how Romero could keep himself going and whether Chick should have thrown in some chanting as Caleb went up in smoke. Still, I'm not going to dismiss some good moments we got in the episode. The scene in Chick's run-down trailer where he and Norman have a conversation was quite good, with both Hurst and Highmore working well to make it a sad moment and giving strong performances. McNally is also a highlight in her brief moments, her hesitancy mixed with her desires giving her much to work with. Brooke Smith, making her debut as the new Sheriff, Jane Green, did extremely well as the Sheriff who is slowly investigating why Jim Brockwell (the thwarted assassin) had the Bates Motel address before jumping bail. You sense she doesn't suspect on the surface that something is wildly amiss but that she is starting to poke around because police work is dumb...until it isn't. Yet given how Highmore seemed to overplay the worry any questions regarding Brockwell or Romero cause him, one wonders if Green isn't at least a bit curious as to what's up with him. Hidden to me felt a bit like filler, something to take up our time before we get to the main event: Rihanna's guest turn as Marion Crane. It looks like before Ri-Ri hits the showers, we've got to hit a slight bump. Again, not horrible, but for once, I was willing to look away during a Bates Motel episode.